During the past three years a key part of my research as part of the Criminal Corpse project has been to trace the people who suffered the last punishment of the law from their capital convictions before the criminal courts to their public executions upon the scaffold and the post-mortem fate of their bodies. What has become clear is that the death of these people neither had a static definition nor did it always have a discernible timing. The death of one man in particular raises questions over the multiple timings of death and the use of his body prior to and in death highlights an important interplay between issues of power and punishment and martyrdom and memory. James Graham, the first Marquis of Montrose, was a prominent actor in the early part of the religious conflicts between the Covenanters in Scotland and the Stuart monarchy in the mid-seventeenth century, with his initial support for the Covenanting cause before switching to support the King giving him a complex place in the history of the struggle. In 1638 Scottish nobles including Montrose and common people alike signed the National Covenant, the purpose of which was to provide a written document stating their commitment to the Reformed religion and the principle of a church that was not controlled by the crown. However, over the next couple of years Montrose became increasingly suspicious of certain individuals in the Covenanting cause before he finally switched his allegiances to support Charles I in 1644. 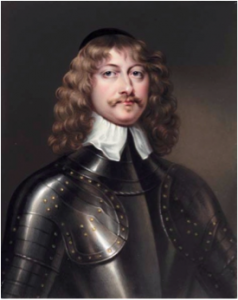 In fighting for the Royalist cause Montrose gained some significant victories but was outlawed, excommunicated and attained for treason by the Covenant, marking the beginning of his legal and perhaps, in the eyes of his enemies, his spiritual death. Following the imprisonment of the King in England Montrose was forced into exile, another stage of his social death, but returned in 1649 to fight for the would-be Charles II. However, in April 1650 his forces were defeated at the Battle of Carbisdale and he was eventually captured by the Covenant. He was paraded from northern Scotland to Edinburgh with his crimes advertised and his name associated with all possible degradation which marked a further stage in his social death. On 19 May he was met at the city gates and conveyed with all possible ignominy to the tolbooth. He was accompanied by the executioner in a cart with the additional stipulation that he remain bare-headed throughout. The cost of the execution included a specially made seat on the cart, to which he would be tied in order to ensure he was in full view of the crowd. He was taken before the Covenanting Committee of Estates to hear his fate. However, as he had been attained and thus convicted of treason in 1644, his legal death had already begun years before he was physically present to hear his death sentence. He was hanged on 21 May at the Cross in Edinburgh and the gallows were ordered to be 30 feet high. In many cases of treason in this period members of the nobility would be beheaded rather than the perceived more disgraceful sentence of hanging. However this concession was not extended to Montrose due to a desire to add even further infamy to his death. His private chaplain George Wishart had written a biography of Montrose which favourably detailed his previous military campaigns and this was ordered to be placed around his neck as a reminder of his crimes. After the body had been hung for three hours it was to be cut down, beheaded and quartered. Within the black catalogue of offences that carried a capital punishment in this period, the crime of treason was set apart in how it was punished. The death sentence extended beyond the extinction of life and the bodies of those condemned were harnessed to send out stark and richly symbolic messages. Montrose’s head was spiked on top of Edinburgh’s old tolbooth and his limbs were displayed in four of the country’s main towns. However, even after the multiple stages of the death sentence had been enacted, he was not yet truly dead. The Restoration led to a wave of Royalist sentiment and the martyred Montrose was used to propagate the themes of loyalty and sacrifice. In 1661 the first parliament of Charles II resolved to provide some “honourable reparation” for the barbarity committed upon him. His dismembered body, once used to mark out his criminality, was to be gathered and given a full public funeral in St Giles on 11 May 1661 at the King’s expense in order to mark Montrose’s legal, spiritual and social rehabilitation which again provokes questions over the timing of his death. However it was more than mere remorse on the part of the monarch driving the proceedings. If we examine the great number of nobles and gentry who were present for the whole spectacle it is clear that it contained friends and foes of Montrose alike. This perhaps further demonstrates that the Restoration intended the spectacle to act as a vehicle to propagate the values of loyalty and to show its strength. 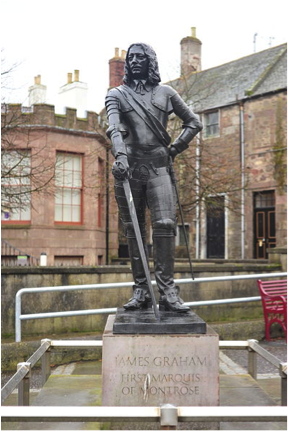 Statue of James Graham on Castle Street, Montrose. Source: Wikimedia Commons. 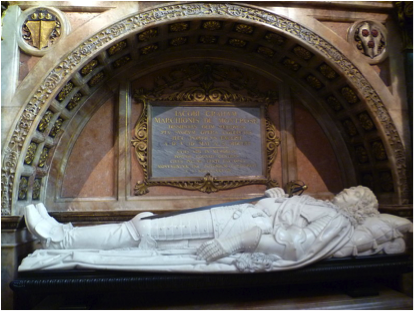 Tomb of Montrose, St Giles, Edinburgh. Source: Wikimedia Commons. Whilst awaiting his execution in the condemned cell of Edinburgh’s old tolbooth Montrose had remarked to the guard “even after I am dead I will be continually present…and become more formidable to them [the Committee of Estates] than while I was alive.” However, despite making this statement, Montrose himself could not have foreseen how both his body and his legacy would be utilized by both the Covenanting and the Royalist causes to propagate entirely different values. His three-day execution spectacle was replete with the hallmarks attached to the punishment for offences against the state, from the ignominious public procession to the multiple stages of the execution itself. Furthermore, the displaying of his corpse to indefinitely mark out his criminality was intended to prolong his legal death beyond the extinction of life. However, in conducting a public funeral, the Restoration regime changed Montrose’s identity from that of an executed traitor to that of a murdered martyr and reconciled him religiously and legally. 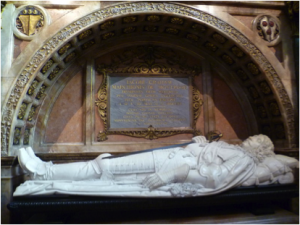 Therefore, while he may have suffered an ignominious execution in 1650, in the eyes of the Restoration regime Montrose was officially rehabilitated in the public memory in 1661 and it was his lavish funeral and ceremonious burial that marked his official death. However the figure of the great Montrose continues to loom large in Scotland’s national history and his story continues to captivate thus we can question will he ever be truly dead? Dr Rachel Bennett completed her PhD entitled ‘Capital Punishment and the Criminal Corpse in Scotland, 1740 to 1834’ after a fully-funded studentship as part of the Criminal Corpse project. This post includes some of her research for a forthcoming chapter: ‘A Candidate for Immortality: Martyrdom, Memory and the Marquis of Montrose’ in Shane McCorristine (ed), When is Death? : Interdisciplinary Perspectives on Death and its Timings (Palgrave: Forthcoming 2016).